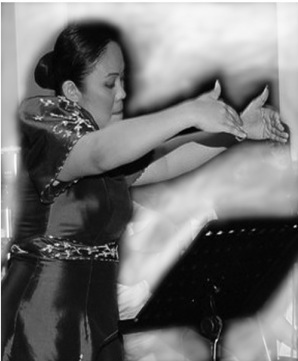 Choral Conductor April Manalo was an active chorister and classical vocalist prior to her current post as choirmaster of Bridges Chorale. She has conducted the prize-winning Manila Adventist Medical Center (MAMC) Church Choir, Channels and the Coro San Benildo of De La Salle University- College of St. Benilde, and was a voice consultant of the University of the Cordilleras Chorale (Philippines) while serving as President of the Philippine Choral Guild, Inc. She has also served as Music Minister for the Crescenta Valley SDA Church. After her stint with the Philippine Madrigal Singers first European Grand Prix in Tours, France and the Tolosa International Choral Festival, April became a professional chorister in the landmark San Miguel Master Chorale, under Prof. Eudenice Palaruan and Artistic Director Ryan Cayabyab. April has also participated in numerous festivals and symposiums on choral arts, such as the 4th World Symposium on Choral Music and World Choirs Festival at the Sydney Opera House and Zimriyah International Choral Workshop Festival in Israel. April was also the Philippine representative and alto soloist for the Asian Youth Choir in 2000 and 2009. As a soloist, she has performed in productions of Rossini's "Le Petit Sollennele", "Pirates of Penzance," "Cendrillon" and Handel's "Messiah." April holds a Masters degree in Choral Conducting from St. Paul University Manila College of Music Manila, Philippines, a Bachelor's degree in Voice Performance from University of the Philippines College of Music where she was a University Scholar and a recipient of a Chancellor’s Award, and a Performer’s Certificate in Voice Performance from La Sierra University Riverside, California.